HTC has launched the HTC U11+ which shares many characteristics with its smaller cousin U11. Both phones are powered by a Snapdragon 835 chipset and come with, depending on region, 4 or 6GB of RAM. They also share the same camera specifications that made the U11 one of the best camera phones in 2017. On the back, you’ll find a 12MP sensor with large 1.4µm pixels that is combined with optical image stabilization and a fast F1.7 aperture. In video mode the U11+ can record 1080p footage at 120fps, and 4K clips with Hi-Res audio. At 8MP, the front camera pixel count has been reduced compared to the U11’s 16MP sensor. The front module also offers an 85-degree field-of-view, an F2.0 aperture and 1080p video recording. The big difference between U11 and U11+ is the latter’s almost bezel-less LCD display with 18:9 format and a 1440×2880 pixel resolution. It means there are now no physical controls on the front and the fingerprint reader was moved to the back. The body is IP68-certified and comes in Ceramic Black, Amazing Silver and Translucent color options. There’s also a microSD card slot and the 3,930mAh battery offers support for Qualcomm Quick Charge 3.0. 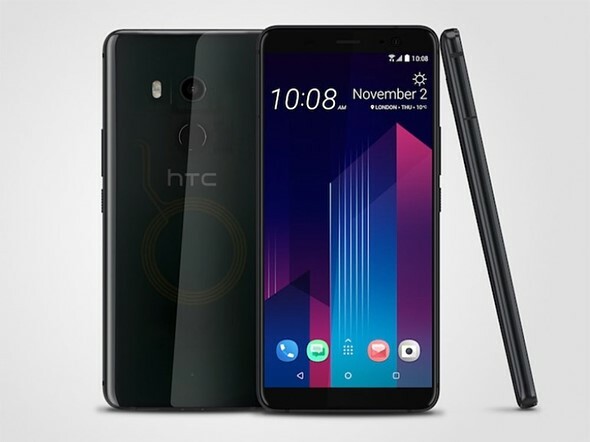 In Europe, the HTC U11+ will be available for €800 (approximately $930). For now a launch in North America is not planned.